An invitation for a baby shower arrived today. I am glad that I have finished all nine squares of this baby's blanket. I need only assemble and border it. It would be great to have this finished in time for the shower, but I will not rush myself. When I accepted this assignment, I asked when she needed it to be finished. She said she wanted it by the beginning of November, so I will not be falling down on the job if I do not have it completed in time for the baby shower. I already have a sweater knit for this baby, but I would like to include a hat and booties with it, too. I am probably being overly ambitious to want to include a Baby Surprise Jacket in the package, but I am so excited to knit it that I may be able to make it happen. The test knitting is progressing wonderfully. I will be finishing these soon and sending them on their way. I love this pattern. They look like a good candidate for a spin and knit project. I also need to package up the hats I have knit and get them mailed. I need to get them out to Becky by the beginning of October. She will then mail all of the hats we have knit so that they arrive by the October 14 deadline. I am feeling good about getting the deadline knitting done on time, but the clock is ticking louder. It has been another long day with an early beginning in preparation for another longer day beginning even earlier. Of course, you know this means I did not sleep. I am pleased, however, to write that I put the insomnia and waiting time to good use. I have made my way through the seventh square and begun the eighth. That blanket will be done soon. I also knit two more Foliage. 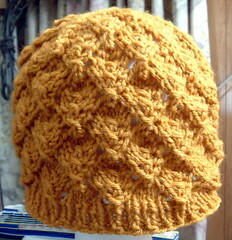 I did one more in the same golden, worsted weight yarn, and the second using green, chunky yarn. I did go down on my needle size from US 7 and 5 to US 5 and 3 for the gold hat. This pattern is such a quick knit. I estimate my knitting time at five to six hours for the worsted version, and three to four hours for the chunky version. There were times today while knitting the chunky hat when I could only knit two rounds and then had to set the needles and yarn aside because I was so exhausted. It felt like this (second picture) kind of work. Seriously. When I came across the link in my inbox from one of the Skanks, it was as though someone had been peeking into my mind. Anyway, I think I have enough of these yarns to knit another gold and another green if I feel like it. If not, I am still pleased to have these three hats to send off next week. It is not going to be all Foliage, all the time around here. I still have the last two blocks to complete on the blanket. Then it will be the fabulous assembling and border. I have already nixed the ruffled border. The directions did not look good, and I think the blanket will be more useful with a border that lays flat. Besides that, I have some fabulous test knitting to do. I was delighted to find the yarn in the mailbox today. I just need to get some sleep so that I can get started. Some things just are not meant to be. I was hoping to make it to Atlanta to attend the Yarn Harlot event. I thought that I might get the chance to meet some people and have a fun time. Besides, my husband was going to drive, and that would have been a lot of knitting time. None of the Skanks are able to make it, either. Between travel, motherhood, employment obligations, and life, we figure we will have to try again on the next tour (unless, perhaps, she has an event closer to us?). Speaking of the fabulous Skanky Knitters, I received a gift from one on Monday. Laura is out-of-town right now, but she asked Margaret to give it to me. It is the Baby Surprise Jacket pattern. I have been talking about the pattern and quite interested in knitting it for a while. Laura brought me her Opinionated Knitter book for me to look through last week. It looks like a good book, but now is not the time for me to get more books. I was so thrilled and surprised to receive this very thoughtful gift. I can hardly wait to knit it. I have been mentally going through the stash for prospective yarn choices. I have so many ideas. I am plugging along on the baby blanket that I promised to knit. So far, I have knit five of the nine squares. I figure that puts me at about 40% of the way through. I knit the more complicated squares first. I only have the four plain lace squares left to knit before assembly and the border. I am pleased that this is moving along at a nice pace. I want to finish it quickly so that I can move on to knit things I enjoy more. Therefore, I am using the wonderful new BSJ pattern as a reward. I have not decided exactly how to work it, but maybe I can knit it after I finish this, or maybe after I finish all the squares. Whatever I decide, it is a great motivator, and one more reason to thank Laura. Saturday was lovely. We got to experience Autumn. We may be back to a warming trend for the weather, but it has not stopped the new Knitty. I checked it out, and I like a few patterns. My needles and life are pretty full right now, so it might be awhile before I get to some of them. Still, I was ready to knit a hat, so I knit Foliage. I have not knit many hats from the top down. It was a bit fiddly at first, but after a few rounds it was easy. I knit Version 2. It calls for worsted weight yarn, while Version 1 calls for Chunky weight yarn. I may have some chunky yarn in the stash. I am not a fan of the chunky yarn, nor do I have much use for it, but I bought a bit when I wanted to knit something for someone and it called for it. That project probably ought to be frogged and might be turned into more of these hats. Anyway, I liked the pattern. It was a quick, easy knit. I got a light lace and chart fix, and hat is always good. I did a modified Emily Ocker cast on (found in Simple Socks Plain and Fancy by Priscilla Gibson-Roberts) instead of beginning as directed. The hat turned out bigger than I had expected, (it fits me) but it is not a problem. I will change needle size and perhaps work one-half fewer repeats of the Leaf Lace Chart the next time I knit this pattern. This hat will be mailed off by October 1st along with any others I can finish in time. Over at Caps for a Cure, we are taking the month of September to knit hats for Knitting for Noggins. They are looking for all sizes of hats. I will try to make all of my hats larger sized because I figure most people will be knitting smaller ones. The Print O' the Waves Stole has made its way to my mom. I blocked it after I took the previous picture, and it was ready when my stepdad called to say he was coming over. This was going to work out just great. I could bake up the cookies and give them to him, and he could take the shawl to Mom. It is good when things work out well. I wanted Mom to have the stole for some waiting room time she has coming up soon. 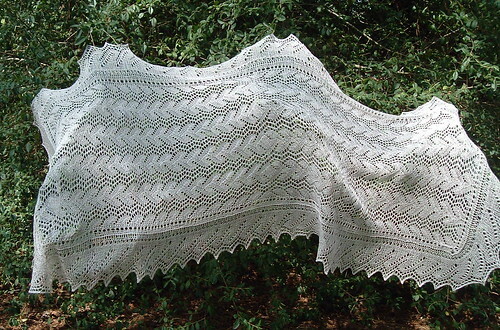 I think of shawls as knitted hugs. I hope this keeps her warm and feeling loved. I have met my self-imposed deadline. Only blocking, waiting, and gifting remain. I will dish details soon. The real trick is going to be baking the cookies and keeping them safe until it is time to deliver them with the stole. Of course I have knit many other pairs of socks, but this is the first pair I have knit from yarn I have spun. Needles: Knit Picks Fixed Circular 2.0mm/US 0, 32"
Interesting Tidbit: These socks fit either me or my husband. It is some sort of magic trick that I cannot replicate. Months ago, most of the Skanky Knitters received an email with the subject, "Super Secret Knitters No Christinas Allowed." It was a plan hatched by Laura to knit a baby blanket for the baby Christina is having in November. Between a flurry of emails and hurried conversations while keeping a lookout for the expectant mama, we decided on squares knit from Knit Picks Shine Sport. Laura would assemble the blanket. The colors were assigned, and the yarn was ordered and distributed near and far. Yes, even the re-located Skank, Brittany, contributed lovely squares. Finally, we gave the love that is group knitting to Christina. I got out my camera and tried to take a few pictures without getting in the way too much. You see a bit of the blanket, and yes, that is the wee one growing away under that grey t-shirt. I am so pleased with the way the blanket turned out, and I think Christina really likes it. It seems like we really surprised her. I hope that the love we put into this blanket follows her son through his life. After all the talk of babies and the pressure of this secret project, I had to let out a potential surprise. I told Christina and Laura that I am thinking of knitting Chicken Viking Hats for their babies. I also plan to knit the adult sized version for my son. Now I just have to find the right yarn for the project. I was forewarned that the right shade for the main color is elusive. If anyone has a hint, I would love to hear it.